How you recognize original Zetor spare parts - ZETOR TRACTORS a.s.
Each original spare part is marked with an indelible stamp and barcode that bears information as to when the part was stocked out, who packed the part and when it was manufactured. Original spare parts are supplied in original packaging carrying the company's logo and labelled with the product number and barcode with a unique identification number. How did these non-original parts turn out? 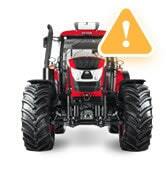 Zetor has carried out a detailed analysis of non-original Zetor parts purchased from unauthorized dealers. The plate does not have the approved type of lining (the approved Zetor lining is from Reibestos). Using a non-approved lining on the plates results in a reduced life, slip at higher engine outputs and, last but not least, increased wear of the.clutch pressure plate. It does not comply with the original drawings – it is 5mm narrower, and thus the contact surface between the hub slots and the clutch shaft is smaller. At an increased engine outputs, the hub and clutch shaft are worn excessively. The non-original water pump and clutch plate cannot be used as spare parts for Zetor tractors. We compared original brake pads from KNOTT with cheaper non-original pads from TEXTAR. Both types of brake pads have a similar brake effect (the same coefficient of friction). In the case of a longer brake load, the TEXTAR brake pads heat to more than 400°C, while the KNOTT pads only reach 200°C. When the TEXTAR pads reach a temperature of approximately 600°C, their brake effect is reduced significantly! To maintain the operating safety of the tractor, it is not recommended to use brake pads from TEXTAR or from other manufacturers of similar products! In addition, using non-original brake pads have a significant effect on the life of the other parts of the brake system – for example the brake discs, brake callipers and sealing elements, which could be largely impaired by the high temperatures the brake pads reach. The connecting rod dimensions complied with the drawing documentation, however, the material composition did not comply with the prescribed material. The connecting rod contained chemical elements of the prescribed material, but in a different ratio. The material also contained other non-standard elements such as aluminum, nickel, copper. Heat treatment of the rod did not comply with the documentation – the material hardness was approximately 10 % less than the prescribed lower limit. Zetor found through testing that the connecting rod could not be used as a spare part for ZETOR UR I engines. There was a risk when using the non-standard part it could deform in the best case, right up to failing completely in the worst! The fitness of the entire engine could be put in question through the use of the non-original connecting rod. An uneven casting at sight; after disassembling, machining burrs were detected in the body. On the inner surface, under the centrifugal wheel, there were discards after imperfect forming, out of which it was possible to scrape foundry sand. After knocking, some more grains of sharp, hard impurities fell out of the body. The insides of the outlet and inlet branches were roughly cast, and on measuring it was found out that the diameters of the inlet and outlet branches were different. The bearings did not fit tightly. The key slot was not made according to the original drawings, and the shaft was rusty in an area where chrome-plating should have been. The width of the vanes and their operating height was not consistent. It was not possible to screw a bolt into one of the threads.